The Overseas Compatriots Affairs Commission (OCAC) published a collection of animated stories from Chinese Learning Biweekly. Through vivid and fun animation, the stories convey culture and education in an easy to understand format. Children learn Chinese while learn what it means to be a good person. 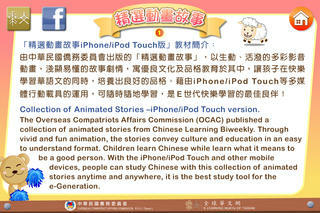 With the iPhone/iPod Touch and other mobile devices, people can study Chinese with this collection of animated stories anytime and anywhere, it is the best study tool for the e-Generation. 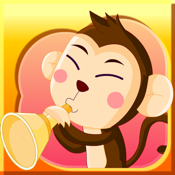 Animation(Traditional) : Story animation with traditional Chinese subtitles. Other Features:(Facebook,Email) Share, Favorites, Search, Index, Thumbnail, Library.